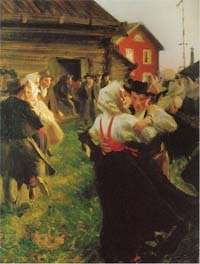 Dance has been one of the features that make a particular culture unique. It is quite common to find a number of dances that would showcase the culture of a particular country in the manner on how the dance is carried out, the accompanying music and even the costumes that are used. Many of these traditional dances have now become favorites for people who are learning and competing in ballroom dancing competitions. Among the favorites are the samba and the salsa. Samba is the national dance of Brazil, but its roots can be traced back to African and European traditional dances. The name samba comes from the Portuguese word sambar, which means ‘to dance to rhythm.’ It is believed that samba was developed in the capital of Rio de Janeiro, although it is also seen in different cities in the country. During the late 19th century, African slaves that migrated from Bahia began to incorporate their traditional dances with the steps of the polka, maxixe and other traditional dances already popular in Brazil, giving birth to the samba. Today, the samba is closely linked to the Carnival, which is the most popular festive event held in Brazil. Salsa, on the other hand, is a traditional dance that originated from the Caribbean, and is now extremely popular throughout the world, particularly in the United States, Dominican Republic and Puerto Rico. Just like the samba, the salsa was developed through the mixing of African and European dances. The difference mainly lies on the manner on how the two dances are carried out. One difference is that the salsa is a dance that involves partners, while samba can be danced in pairs or solo. Another difference is the manner of execution. Samba dancers, particularly those that dance during the Carnival Festival would often dance impromptu. On the other hand, the salsa has a number of basic steps that are carried out by the pair throughout the entire dance in order to give it the characteristic of the dance being the salsa. Finally, there is the type of music that is used. The samba is more open to the variety of the music that is played. Because the salsa is actually more structured than the samba, there are only certain types of music that can be played and used when dancing the salsa. In fact, there are even certain types of music that are considered to be a definite no-no to play when dancing the salsa. 1.Both the salsa and the samba are dances that are a mixture of traditional African and European dances. 2.The samba originated in Brazil and can be danced solo or a group of individuals. The Salsa originated from the Caribbean and involves a pair or groups of pairs dancing. 3.The samba is pretty liberal when it comes to the type of music that is played. The salsa, on the other hand, is pretty strict with the choice of music that is used. Manisha Kumar. "Difference Between Samba and Salsa." DifferenceBetween.net. June 10, 2011 < http://www.differencebetween.net/miscellaneous/difference-between-samba-and-salsa/ >.